No Damon, no problem, right? Jeremy Renner is a capable action star, so there shouldn’t be any hiccups. Plus he’s a great actor as evinced by his Oscar nominations for “The Hurt Locker” and “The Town.” And Rachel Weisz is a perfectly capable actress to match him; after all, she has the Oscar win (for her riveting work in “The Constant Gardener“) that has eluded Renner’s grasp. Not to mention, the franchise is in the capable hands of Tony Gilroy. He wrote the first three installments in the “Bourne” universe, which were all awesome. And once those were done, he moved onto direct the taut, immaculately constructed “Michael Clayton” (earning him Oscar nominations for writing and directing) and the twisty thriller “Duplicity” (which does not get nearly enough credit). Yet for all these reasons that “The Bourne Legacy” should work, it absolutely flops. The expression the higher the pedestal, the harder the fall has more to do with the expectations surround the film than an evaluation of quality; however, a spin-off, sequel, or whatever the heck this movie “Legacy” claims to be cannot escape being measured against its predecessors. And while the Greengrass/Damon films had a palpable sense of forward momentum that propelled the franchise, Renner and Gilroy’s take on the “Bourne” universe is dead on arrival and drags for 135 long minutes. Let’s just clear up the misconceptions from the get-go: I won’t be reviewing “Green Zone” as if it were the fourth installment of the Bourne series. Just because it’s a reunion of Matt Damon with director Paul Greengrass does not mean that they are going to keep making shades of the same movie. Assuming so would mean that you see no difference between “Taxi Driver” and “Goodfellas” – both were directed by Martin Scorsese and starred Robert DeNiro. The only similarity you might see between Damon and Greengrass’ latest collaboration and the Bourne trilogy is the shaky camera action. Directors usually shoot their movies in a similar style save that it fits, so there’s really no grounds for a comparison. Unless, of course, you like to relate potentially nauseating experiences. Call it “Mr. Smith Goes to Washington” for the Iraq Era, if you must find some movie to compare it to. Instead of having its heart rooted in the wholesome simplicity of small-town values, though, “Green Zone” is rooted in CNN cynicism. Damon’s Roy Miller is a captain leading the unit searching for weapons of mass destruction (WMD) who sees his duties as very black and white. Either the WMDs are at the site or they aren’t. But he is operating in a decidedly gray moral atmosphere, where war wages between the CIA and the Pentagon once the Iraqis are defeated. The debate rages on how to incorporate the native people into the new regime in post-“Mission Accomplished” Iraq, yet Miller can’t stop thinking about the past. Questioning American motives at a time when the country is still trying to justify their invasion doesn’t make Miller very popular, and he is forced to wander slightly outside his boundaries to get the answers he wants. He doesn’t so much as go Sarah Palin-style rogue as he tracks down the truth, but he’s hunted as such. There’s more to March than just the Oscars. Finally, March arrives and we can stop dwelling on 2009. In my opinion, March is usually a pretty decent movie month. This year’s crop looks especially promising with new movies from Tim Burton, Paul Greengrass (“The Bourne Ultimatum”), and Noah Baumbach (“The Squid and the Whale”). After almost 3 months, “Avatar” will have to cede those illustrious 3-D and IMAX screens to Tim Burton’s twist on “Alice in Wonderland.” The titular character is played by relative newcomer Mia Wasikowsa, who will look quite a bit older than the Alice you remember from Disney’s 1951 animated classic. If that’s not a big enough draw for you, surely Johnny Depp as the Mad Hatter (who will hopefully channel more of his glorious Jack Sparrow than his Jacko-esque Willy Wonka) will suffice. No? How about Helena Bonham Carter as the Queen of Hearts? Or Anne Hathaway as the White Queen? Perhaps Alan Rickman as the Caterpillar? No doubt about it, this is one exciting cast, and I’m sure Tim Burton won’t have any problem distinguishing himself from the numerous “Alice in Wonderland” rip-offs that have sprouted over the past few years. “Brooklyn’s Finest” is directed by Antoine Fuqua, helmer of “Training Day,” which was enough to get me interested. However, it really looks to be little more than a mash-up of every cop movie ever made. But hey, that may be your thing, which would make this your potpourri. I’m excited for “Green Zone,” which looks to be a smart political thriller. See my previous post at the release of the trailer for more info. On the indie side of things, Noah Baumbach looks to return to Oscar form after “Margot at the Wedding” underwhelmed with “Greenberg.” The movie stars Ben Stiller as Greenberg, the grouchy misanthrope who finds a reason to be pessimistic about everything. However, a special woman comes along and begins to melt his heart. I’m looking forward to a double-edged performance from Stiller, one that can show off his dramatic chops but also give us plenty of hearty laughs. Seth Rogen’s four roommates in “Knocked Up” were equally as funny as he was. Each of them have slowly gotten their “moment”: Jonah Hill in “Superbad,” Jason Segel in “Forgetting Sarah Marshall.” Now, it could be Jay Baruchel’s turn. “She’s Out of My League” pits him similar situation: the uncomely guy getting the smoking hot babe. Hopefully Paramount gives this the push it deserves, maybe making Baruchel a breakout comedic star of 2010. Could “Remember Me” get Robert Pattinson the Razzie for Worst Actor? After narrowly missing the cut for his two performances as Edward Cullen, this could finally be the one to get him the kind of awards attention he deserves. A scant five days after the best movies of 2009 are crowned at the Academy Awards, a movie will be released that could have been among those. 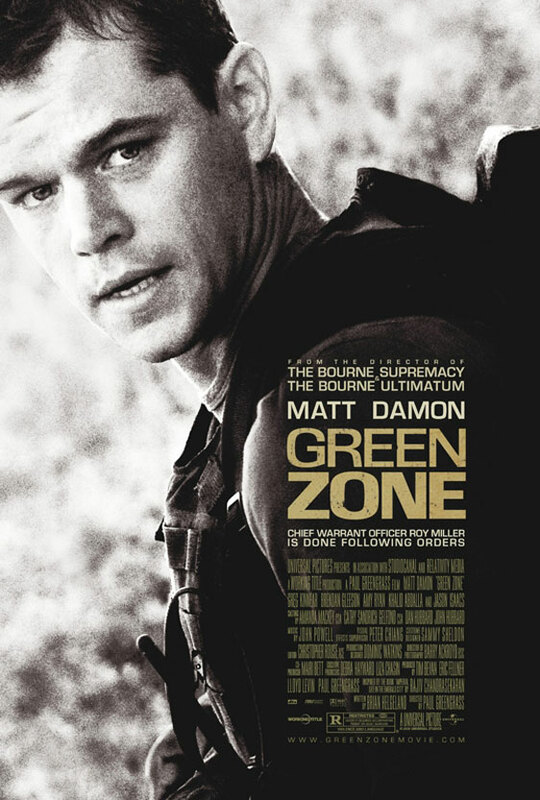 “Green Zone” was slated for release this year, but the decision was made to push it back to 2010. This was probably for financial reasons as so many great movies get lost in the heap during the month of December, and this year has taught us that a movie can make a nice chunk of change in the early months of the year. “Green Zone” reunites the versatile Matt Damon, who at the time of release could be fresh off an Oscar win or nomination for either “The Informant!” or “Invictus,” with Paul Greengrass, director of the final two installments of the Bourne trilogy. But Greengrass is capable of making something other than an epic action movie; he was nominated for Best Director at the Academy awards in 2006 for his work on “United 93.” Damon’s character Roy Miller is a U.S. Army officer in the volatile Green Zone region, the center of international presence in Baghdad, who discovers that the CIA is working directly in opposition to his efforts to remove terrorist leaders. In order to do what he feels is the greater good, he goes rogue. Featuring an ensemble cast including Brendan Gleeson, Jason Isaacs, and Oscar nominees Greg Kinnear and Amy Ryan, “Green Zone” can hopefully provide awards-level entertainment in the fairly barren winter months. However, the movie being set in Iraq could hamper the film’s receipts. There has yet to be any bonanza made off a movie set in the Middle East, and only recently has their been a movie, “The Hurt Locker,” that has opened to widespread critical acclaim (although I loved “The Kingdom” … never have I felt so patriotic). That movie focused more on characters and not on action, and if the same applies to “Green Zone,” it should do fine. Universal put out two trailers for the movie this week. The domestic trailer makes it look more like the “Bourne” movies with plenty of action, while the international trailer focuses more on the plot. I embedded the international trailer here because if you have read this blog at all, you know my main concern is story. A side note/quick pondering, does this mean that Universal thinks that Americans only want action and no plot? Whatever the case may be for “Green Zone,” I’m sold.